If you are new to Artist Trading Cards I would highly recommend referring back to my Gallery Page on ATCs for inspiration and ideas after you look at the instructions here. This page was written as a lesson for one of my creative swaps in 2016. I started with blank canvas pieces shown in photos 1-3 below. I also used watercolor paper, matte board and card stock cut to size to create my ATCs. 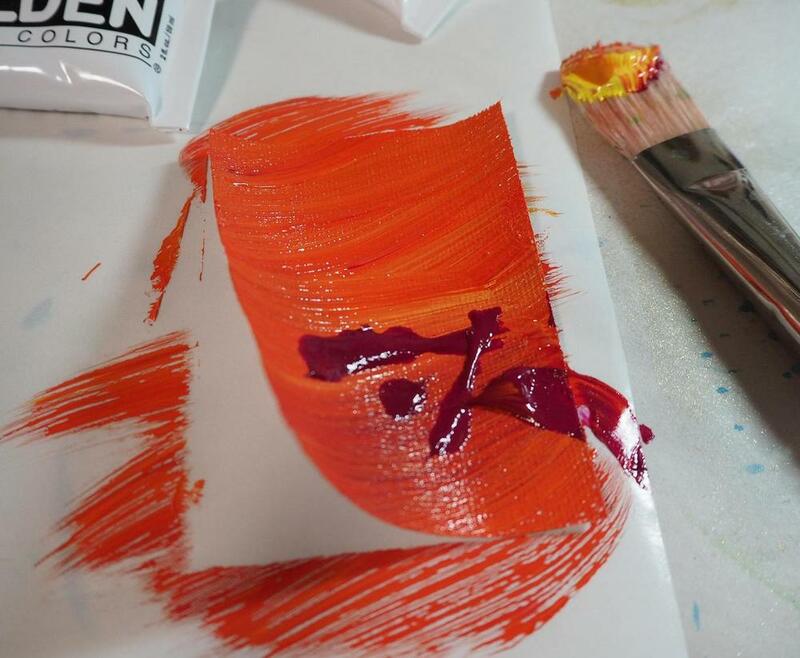 I played with brushing different colors of acrylic paint that seemed "sunset" in nature to me, onto the various surfaces. 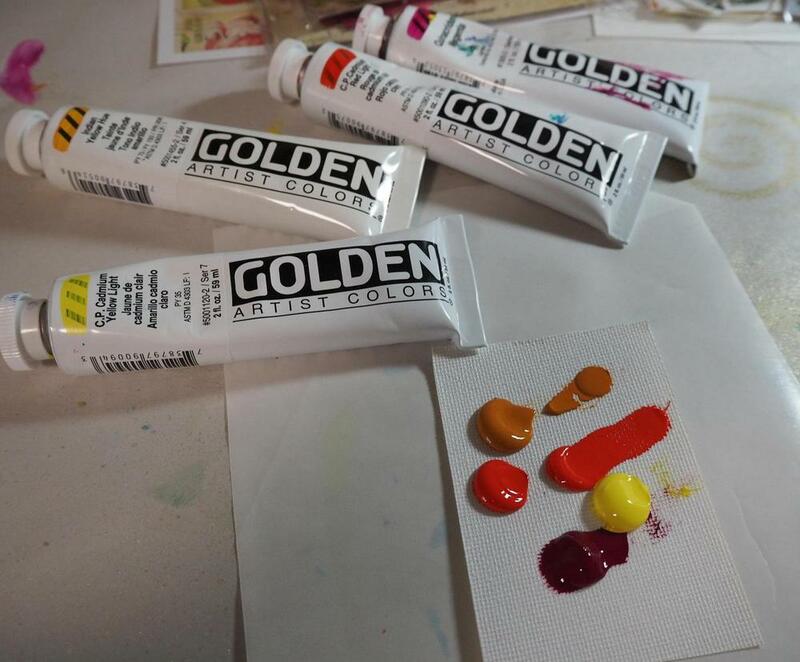 I used Heavy Body Golden brand Acrylic paints because I have it on hand. Any brand of acrylic paints will do! Click on any photo for a larger, more detailed view. Use the side arrows to navigate to the next photo. 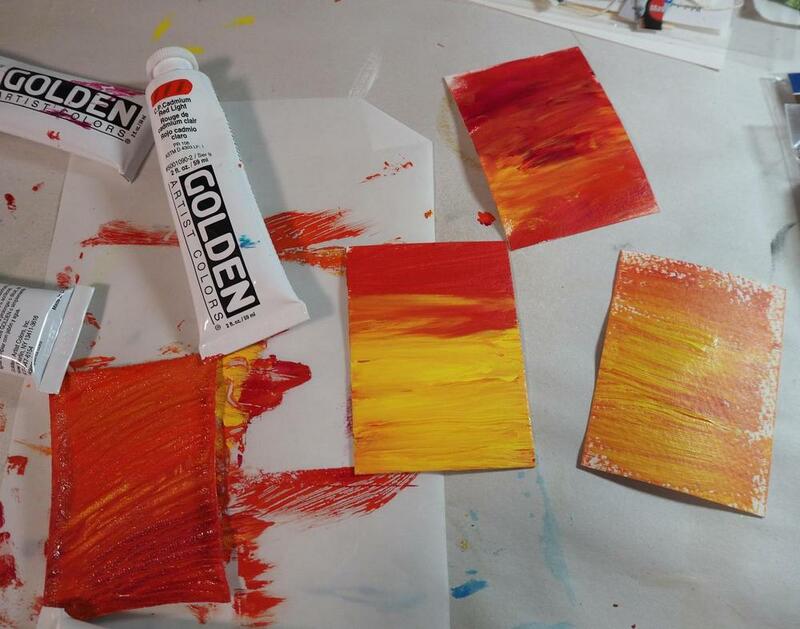 After brushing the acrylic paint on, I felt the sunset colors needed a bit of a golden sparkle. 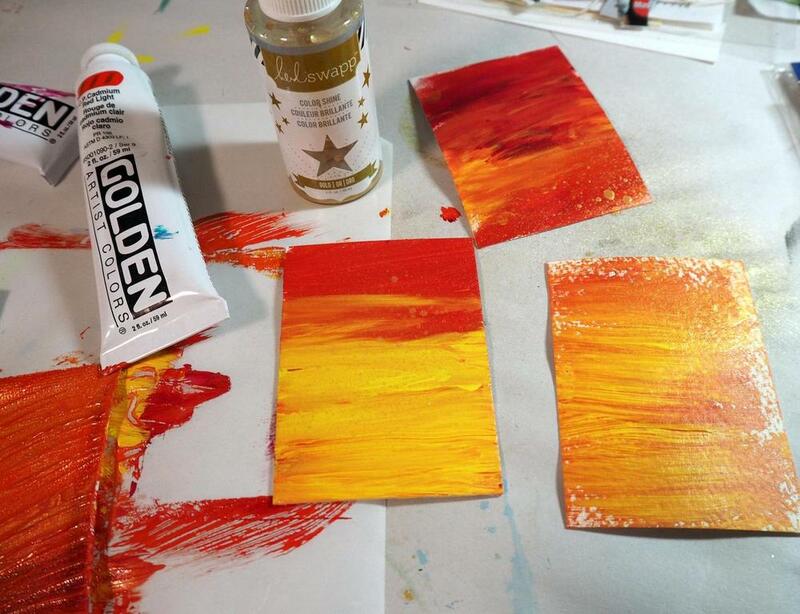 I grabbed my spray bottle of Heidi Swapp Gold Color Shine and spritzed some on all of the ATCs. You'll see later that I carried the golden sunset theme further by adding a border with a gold Metallic marker (a Krylon 18K Gold Leafing Pen) to some of these ATCs . I added texture to the ATC done on canvas by dragging the end of a paintbrush through the wet paint; view the first photo below. There was a lot of paint on this tiny canvas from my experimentation and so it worked out well to do this, revealing earlier paint layers. You can purchase canvas in sheets on a pad, like watercolor paper. Cut the canvas to whatever size you need. Canvas is too flimsy by itself for an ATC, so I decided to sew a scrap piece of rosy colored silk fabric to the back of the canvas to complete it. I could have added batting in the middle, but did not do that this time. 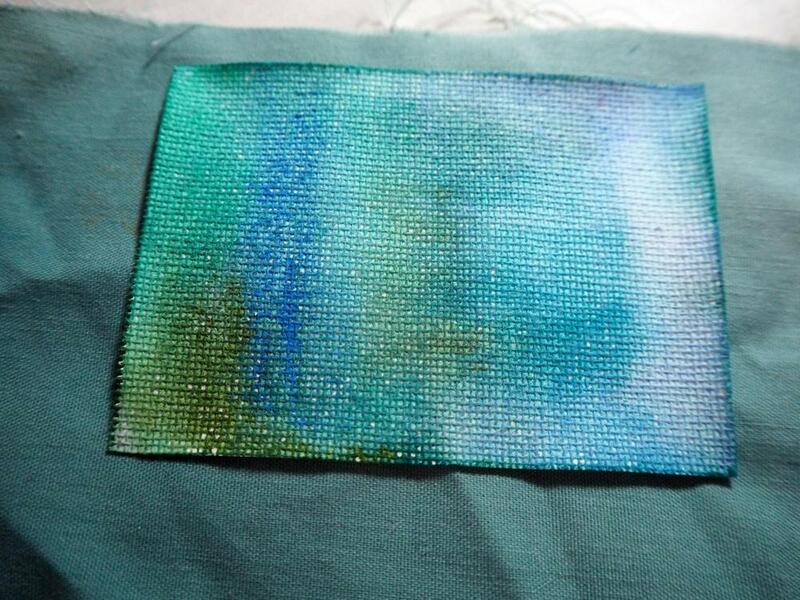 I used gold thread to sew the canvas and silk together. 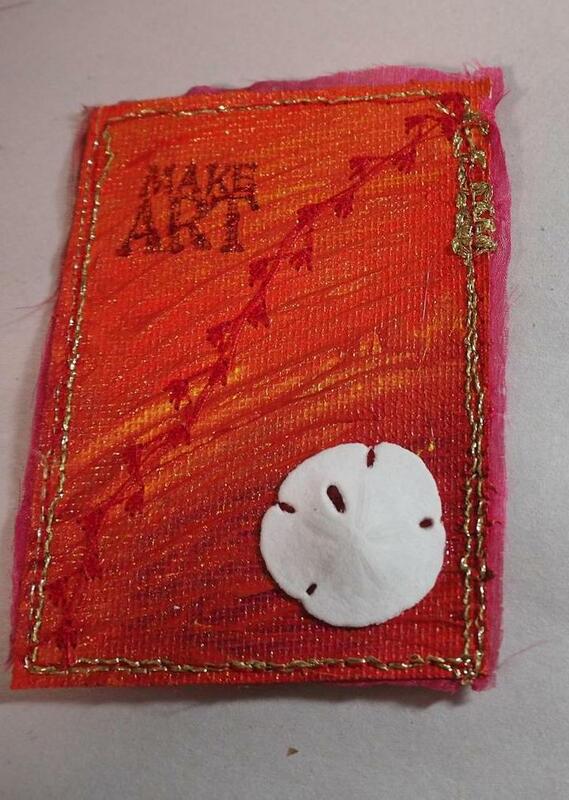 Then, I added a decorative stitch with red thread down the middle of the ATC. Next, a stamp from CatsLifePress on the front: Make Art, and a personal stamp on the back. I wrote my contact info on the fabric with a sharpie permanent marker. The small sand dollar was glued on with E6000 glue. 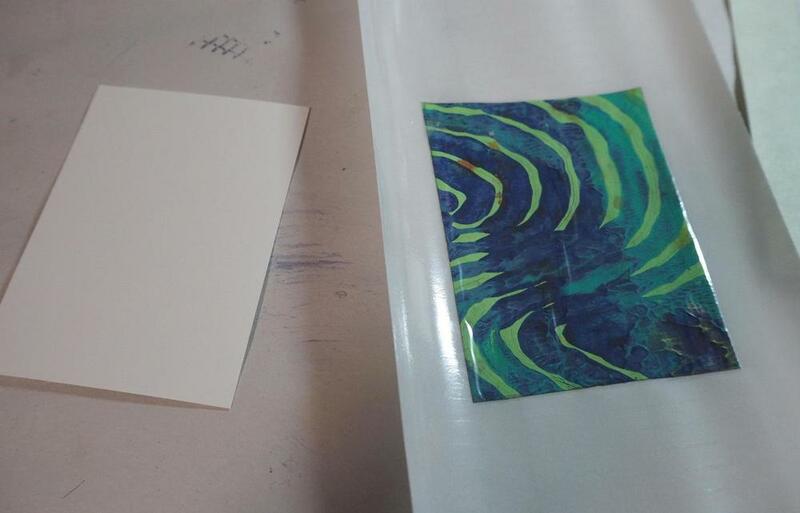 Next, I squeezed the painted matte board ATC through my xyron sticker maker >> then pressed it onto similar silk fabric that was used for the back of the canvas ATC. For the matte board ATC below, I left a generous border of fabric after attaching it to the back, then used white Tacky Glue to secure the extra fabric to the front like a frame. 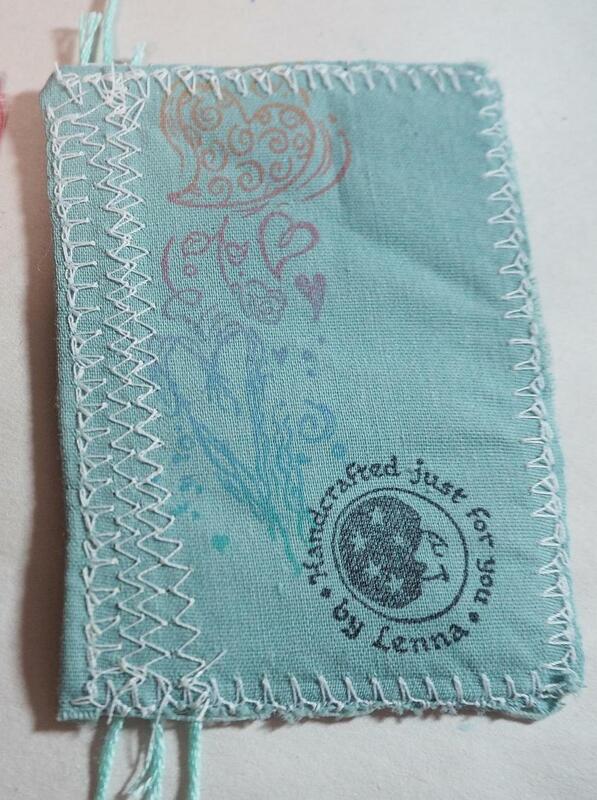 One of my old LennaLines quote stamps was stamped on the front and a CatsLifePress ATC stamp was stamped on the back. 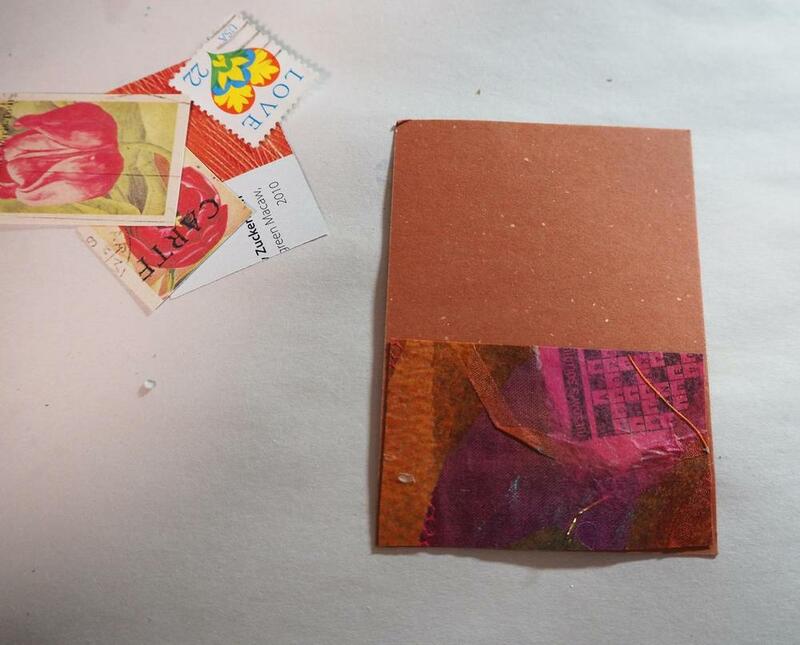 The paper flower (from Alpha Stamps) was attached with tacky glue. 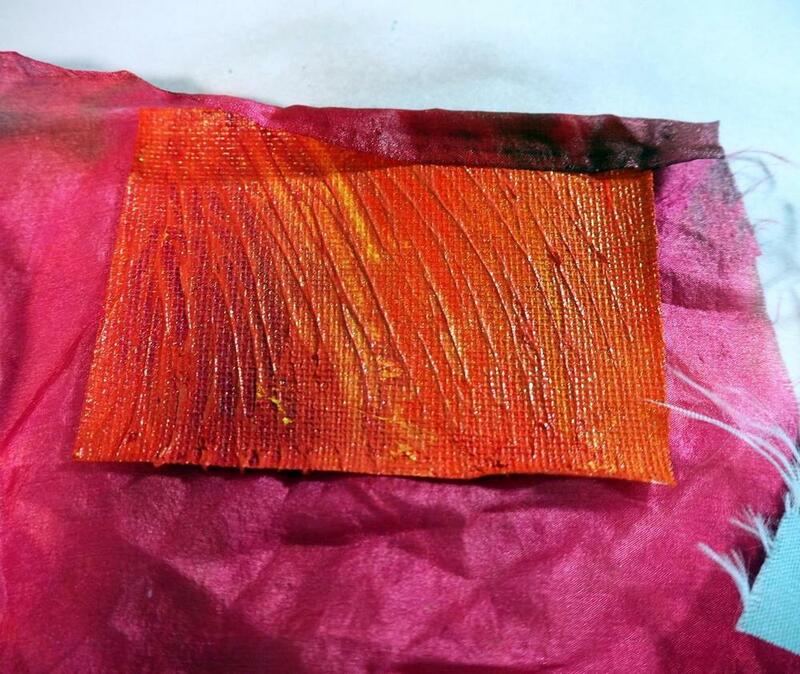 The last photo shows another sunset color ATC created on a cardstock base, painted with acrylic paint and rubber stamped on top of the paint when dry, with permanent StazOn ink! Click on any photo for more detail. 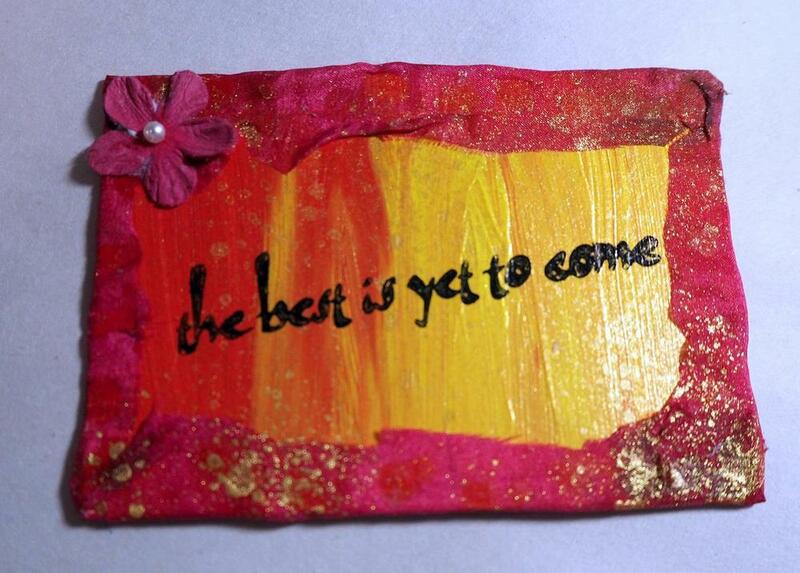 One more ATC was created with acrylic paint and rubber stamping on a watercolor paper base. I'll share it in the last photo below. 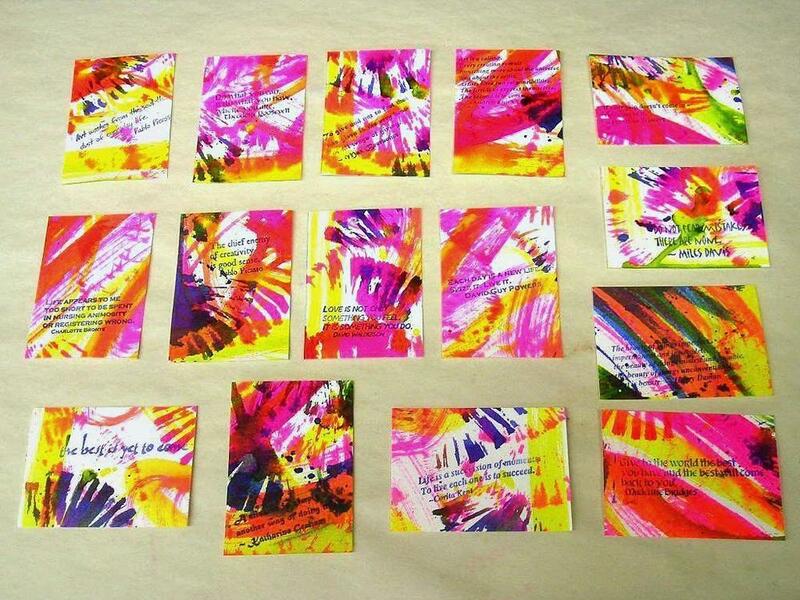 That ATC is another variation of acrylic paints and stamping with mainly yellow tones. 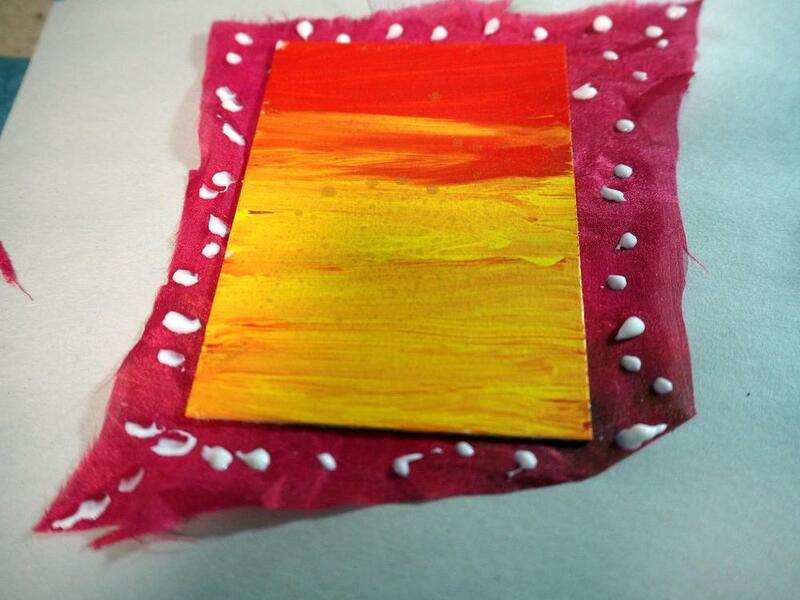 Remember that using acrylic paint is just one way to play and create ATCs! 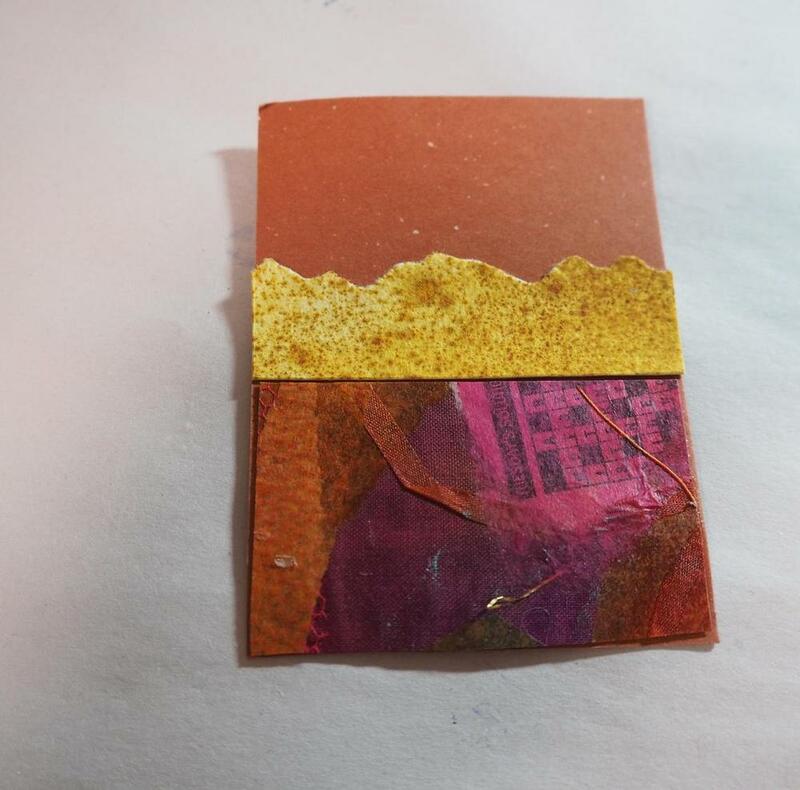 A final card showing off sunset colors was created with paper scraps in collage style and shown below. Of course I added a bit of rubber stamping because I love to stamp! Tacky glue was used for the thicker papers & glue stick for the thinner papers, all adhered on the cardstock base. 4. Watercolor crayons to the rescue! 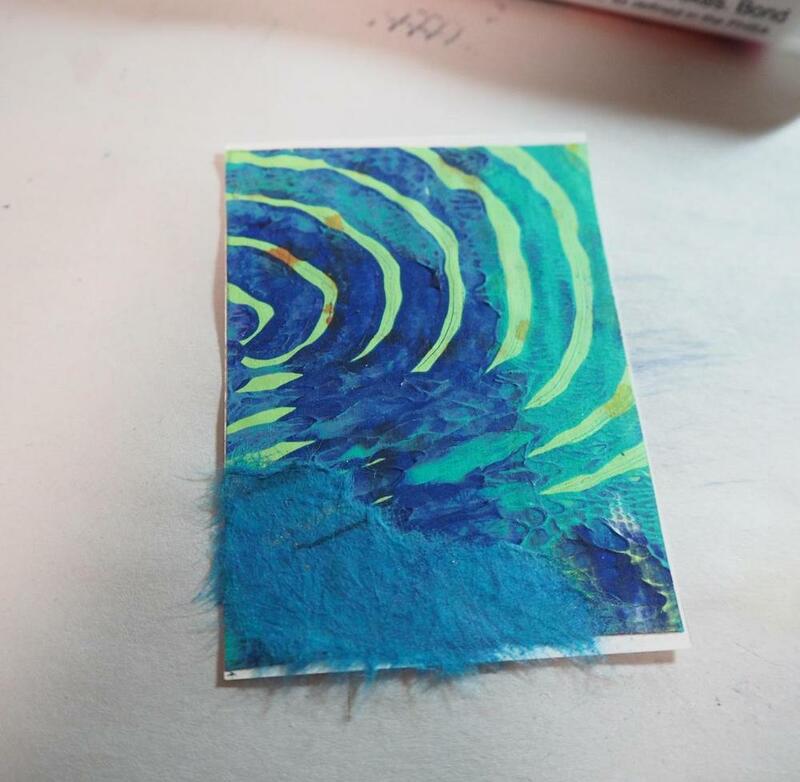 Watercolor crayons are so great to use when creating ATCs - I use the Lyra brand. You can draw with the crayons, or lay color down by scribbling and then activate the color with a wet brush as you will see me doing in the photos below. Or, you can bring a wet brush to the crayon, pick up the pigment from the crayon via the wet brush and then paint your surface with it. 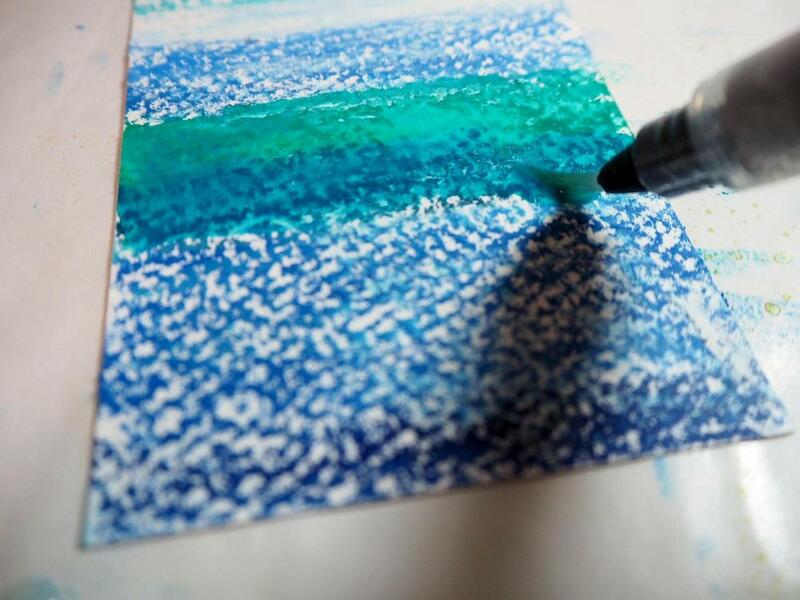 Watercolor crayons are great for ATCs, Collage, Altered Books, Cards and Art Journaling. 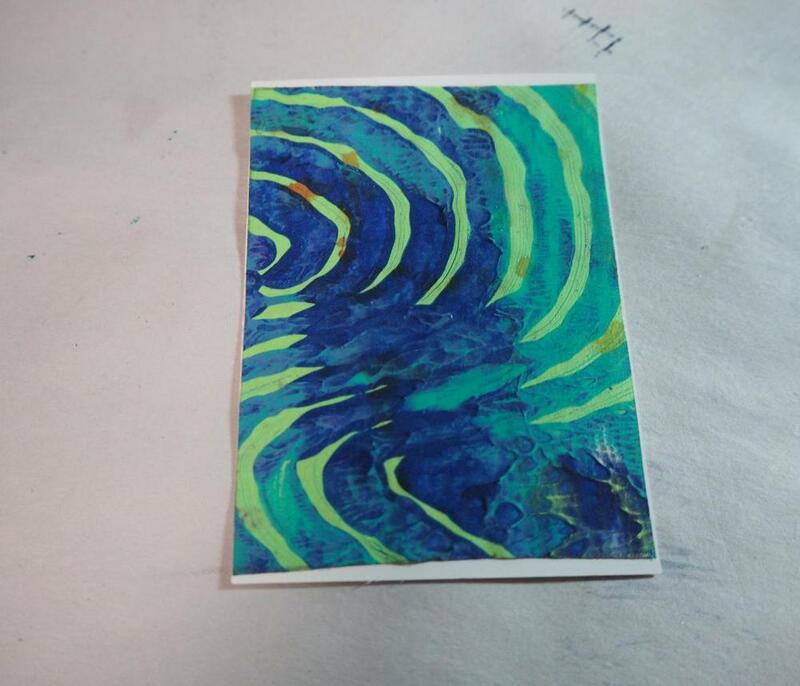 I made ATCs with Ocean colors on both watercolor paper and canvas pieces pre-cut to size, using my watercolor crayons. I also added rubber stamping and even did a bit of heat embossing with pigment ink & embossing powder (the net stamp) - see below. More sewing was incorporated with the watercolor crayon canvas ATC too. 5. Fabric & Paper ATC with no Sewing! 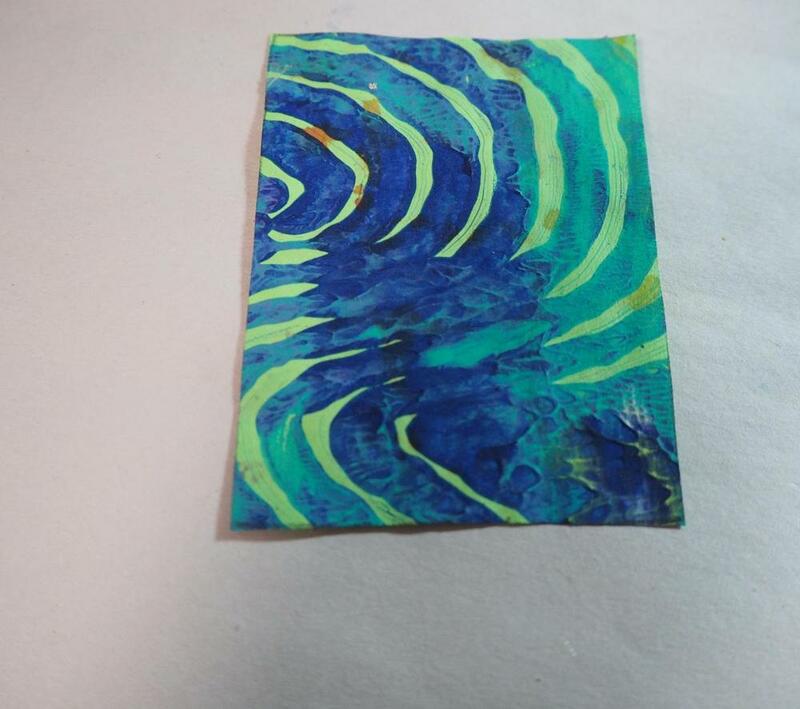 Next, I made a mixed media fabric & paper ATC without sewing, on a cardstock base cut to size, in ocean colors! For me ocean colors meant various shades of blue, grey & white for this ATC. I used Tacky Glue for attaching all of the individual pieces to the cardstock, except for the shell. For that I used E6000 glue, which is very strong holding. If you have a larger pre-printed sheet of paper (scrapbook paper) . . . a page you've painted . 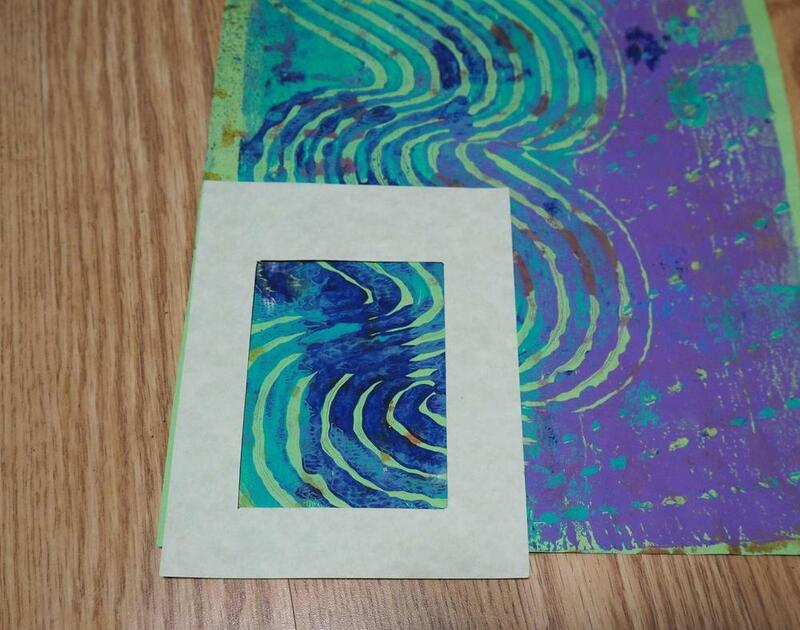 . . or a printed page (stamped or gelli printed) or even a piece of fabric that you'd like to use for your ATC, a cropping frame can be very helpful. This tool helps by allowing you to see what area on a larger piece of fabric or paper might best be showcased - see the photos below. 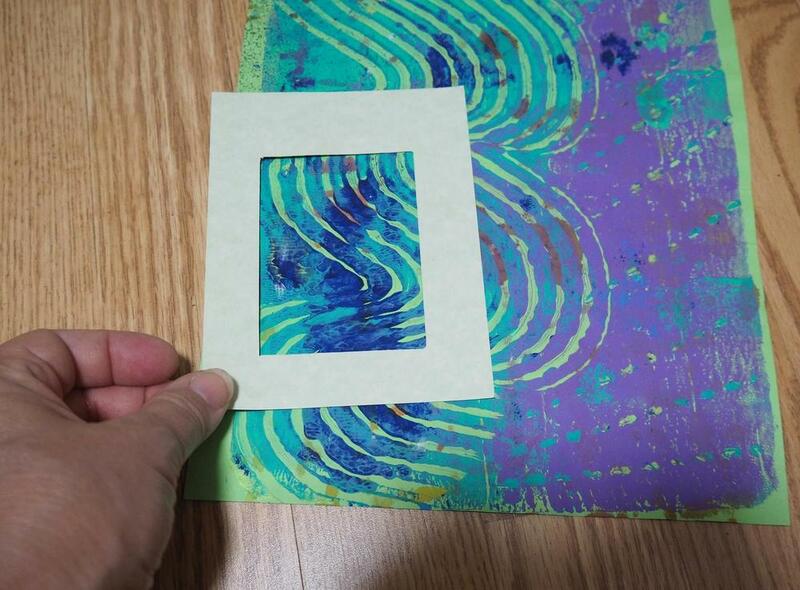 You can make your own cropping frame by cutting a rectangle out of cardstock, then cutting the ATC shape out of the middle. The one I am using in the photos is 5.5" tall by 4.5" wide - 140mm x 114mm. Once you have that rectangle cut out, use a pencil and ruler to measure 2.5" x 3.5" or use another precut ATC to trace the shape of an ATC in the center of the rectangle. Carefully use an x-acto knife and ruler to cut and remove the ATC shape from the middle, or use the x-acto to start the cut, then switch to scissors if you are more comfortable. You can see below how I used the frame to decide my ATC placement. This is just another way you can approach creating multiple ATCs. 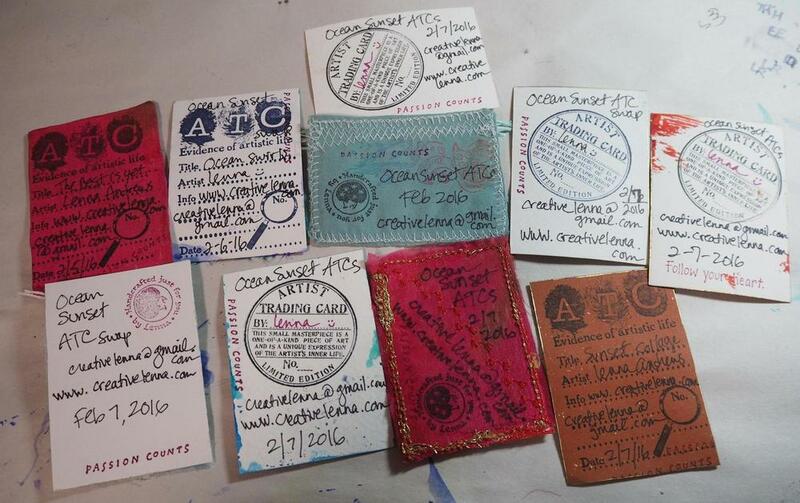 I hope these ideas give you a great start towards creating your own ATCs!